Since a number of people have asked about building contact microphones, particularly from my youtube videos, I’m posting a very brief tutorial here regarding my own experience. There are other web pages here and here that elaborate on the building process. You can listen to some recordings I have made using my self-built contact mics. Contact microphones are actually piezoelectric transducers and are mostly used for producing sound as buzzers, beepers and small speakers in electronic devices. If the signal is reversed using a piezo transducer as a mic instead of a primitive speaker, you’re actually picking up vibrations and having it produce voltage rather than consume it. Connecting this to a recording device or mixer allows you to hear mostly hidden vibrations and resonances as sound. 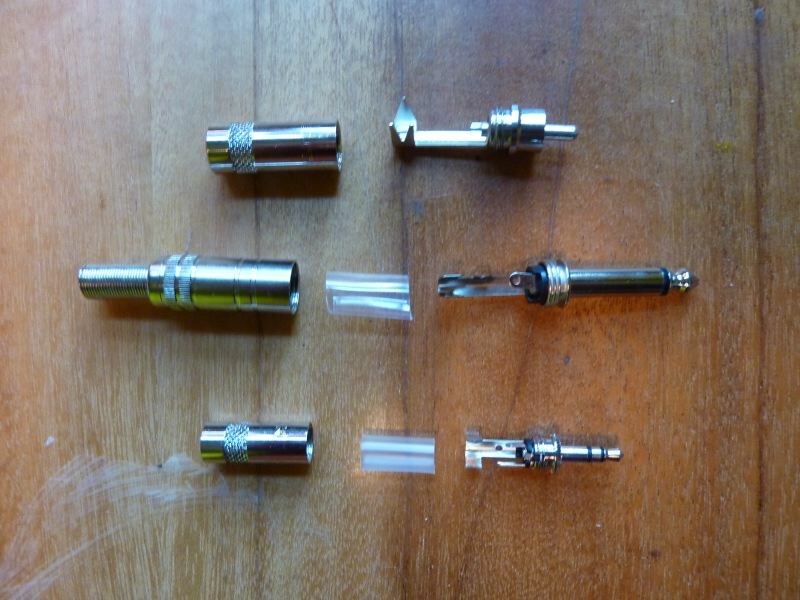 Piezo transducers come in all shapes and sizes, the most common ones ranging from 25-50 mm in diameter. They can be ordered from electronics components distributors such as Maplin in the UK or DigiKey in the US. As for what kind of disc to buy this is a question of great debate, but I generally stick to mid sized discs of 30-40mm with a resonant frequency of 1khz. Best of all they are cheap, usually 50 cents or less a piece, so order a few different kinds to test and see which ones work better. As for building contact mics, the process is fairly simple. A soldering iron and raw solder is needed. Some flux paste is helpful for getting the wires to stick more firmly to the contacts. 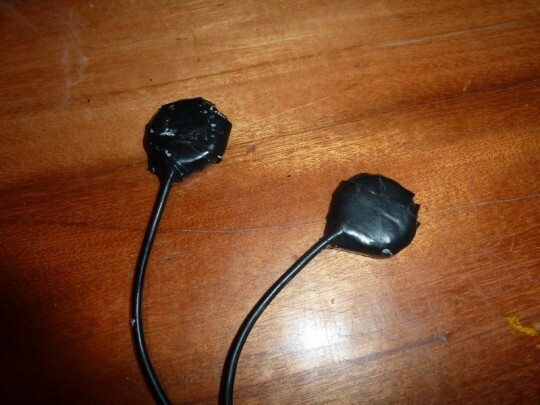 As you can see some piezos come with leads already attached. All you need to do is connect then to a wire and the appropriate plug. The center circle of the disc is the ceramic piezo element (what produces the voltage). The ‘hot’ positive lead needs to be connected to this and the negative “ground” wireÂ needs to be connected to the outer metal part. What plug you use depends on what kind of device you use for recording the signal. Most likely you will connect your contact mic to a mixer or directly to a recording device such as a flash recorder (Sony PCM-D50, Edirol R-09, Zoom H4n, Tascam DR- etc.). I often work in the field and connect my contact mics as a stereo pair to a flash recorder with a 1/8″ mini-jack but I have XLR versions as well. 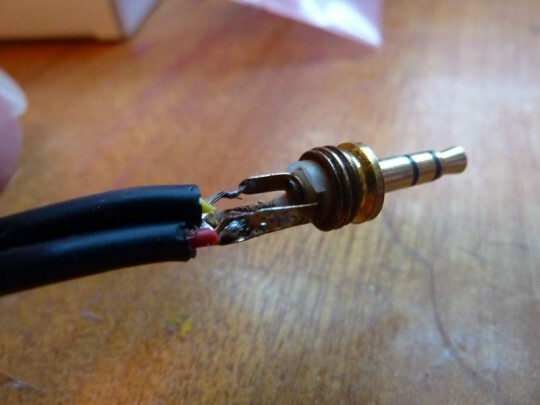 To make a stereo pair, simply solder up two single discs and attach the ‘hot’ +positive leads to the two center signal leads on the mini-jack plug. Then connect both -negative leads to the outer longer lead on the plug. Be sure to insulate any contacts with electrical tape to avoid shorting the signal. Getting good soldered contacts takes practice so always get extra plugs in case you make mistakes. Finalizing your contact mics is an important step. Piezo transducers tend to be fragile. If the ceramic crystal is damaged in any way you’ll immediately know it. 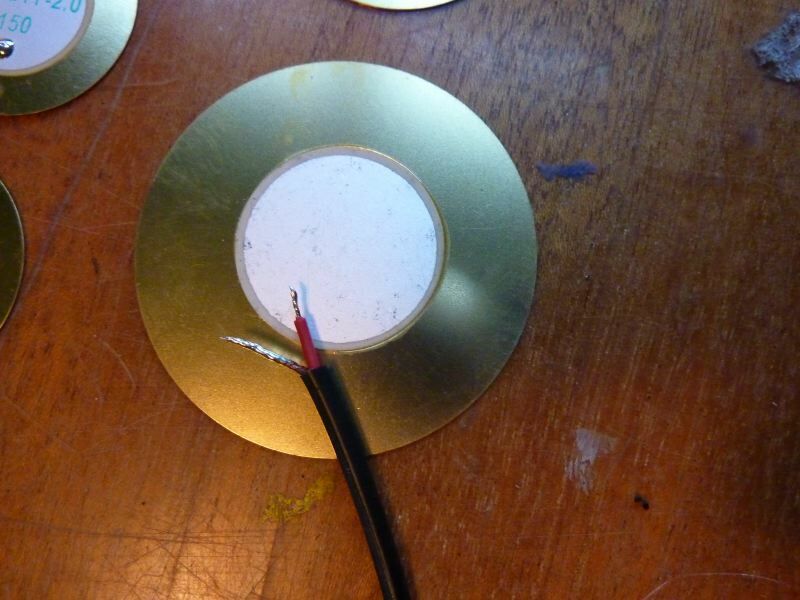 At the very minimum its good to put some kind of glue over the back of the disc to protect the crystal like ‘hot glue’. I sometimes put the felt furniture pads that are used on chair leg bottoms over the crystal to protect it then I cover the whole disc with electrical tape. I also glue a thin piece of wood to the front side with epoxy. This is to make sure the disc does not bend and crack. 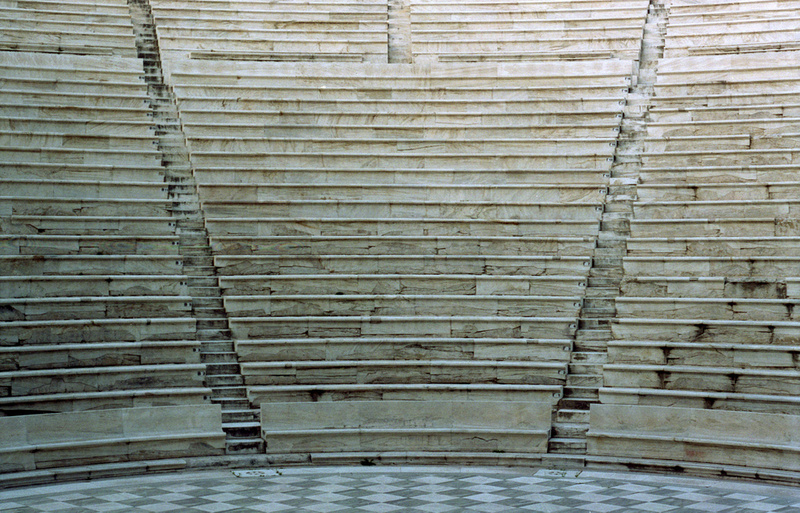 The wood also “softens” the sound as piezos tend to have a sharp metallic sound (since they are actually made of metal). Some people also coat their mics with something like plastidip which makes a nice clean protective finish. Another reason to protect the piezos is because they tend to work better when a bit of pressure is applied. The sensitivity increases and you tend to get much better bass response. With the felt furniture pad backing and wood front I’m not afraid of bending the disc or crushing the ceramic part when using strong clamps or clips. It is also handy to use something like blue-tack to make a firm connection to the surface of what you are trying to record. After all its the Contact that makes a contact mic. 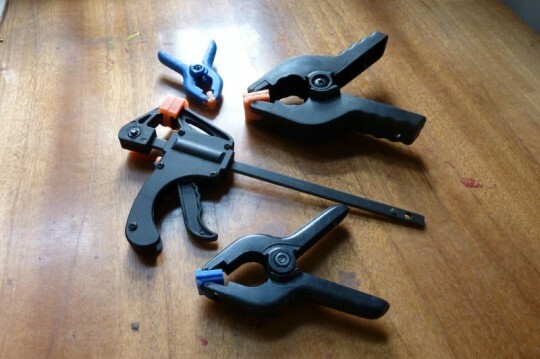 It is good to carry around a number of different clips and clamps for the materials and situations you might encounter. Most of these are cheap and lightweight and can be found from building supply stores. Lastly, this is a device I’veÂ used when recording with my contact mics. The FEL Microphone Amplifier is small, runs from a 9V battery and can boost a stereo signal up to 50dB. This really helps when the source is more quiet or you want to pull some bass out. Most of the time I need to boost the signal about +15-30dB, but occasionally you need more. As a general rule, the better the preamp, the better the signal. Two digital recording devices I’ve used are the Edirol R-09 and a Sony PCM-D50. For some some microphone tests and personal commentary on these recorders check here and here. Hopefully this helps anyone who is interested in working more with contact mics. Most importantly, remember there are no fixed rules about the best ways to use contact mics and it a matter of continuous experimentation. I will update this page if more questions or info comes in. Recording a dead tree in the wind on the Lithuanian coast (below). Recording a suspension bridge in Calgary Canada with contact mics (below). Episode #44 of KCRWs ‘The Organist’ podcast entitled “Contact Milk” produced by Lawrence DunnÂ is about using contact mics for field recording. It features some of my recordings along with some byÂ Lee Patterson, Jez Riley French, and others. Have a listen. 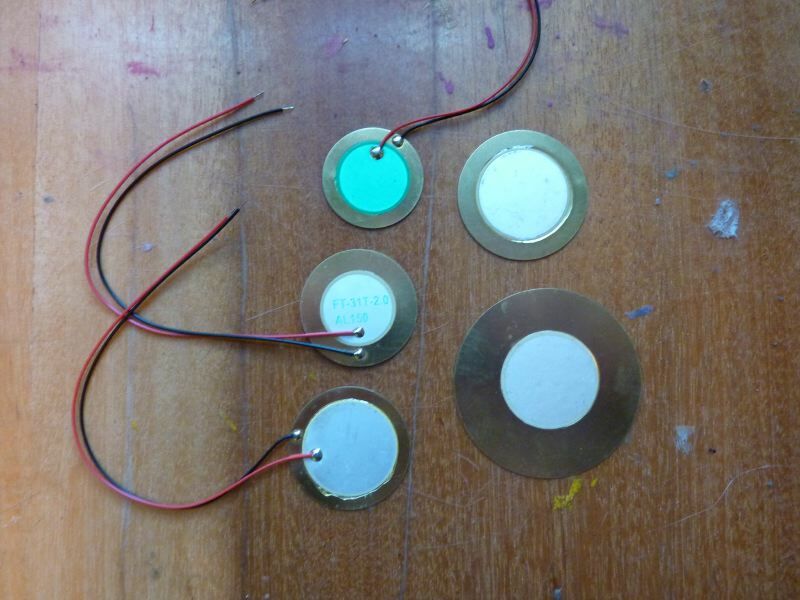 Below is a video from MAKE Magazine about building a contact microphone that includes the schematic plan for a 9V powered amplifier. The amplifier can be handy if you don’t have a suitable preamp on your recorder. 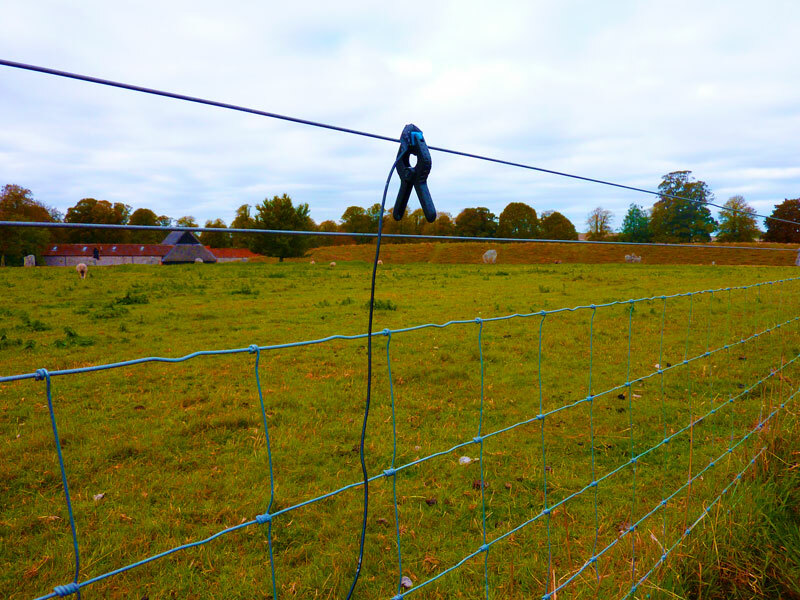 Top image: Recording wire fences in Avebury UK. Very informative post. It really is very helpful. Thank you! I haven’t tried to use one of these, but I’m encouraged to try this. I didn’t realize the surface didn’t need to be left out in the open to make the contact to pick up vibrations, so I’m having trouble understanding how you use the felt furniture pad or piece of wood. Do they go on the vibration receiving side of the contact? I notice that in the final image, the contacts appear to be completely encased in tape-is it possible to lose response from the contacts by over-insulating them? Thanks for this post – I will certainly give this a try! I cover the white inner circle (ceramic crystal part) with the felt furniture pad. On the other (blank) side I glue a thin piece of wood with epoxy. Then I wrap the whole thing in electrical tape. These things actually do dampen the sound a bit but that’s the point, to “soften” the tinny metallic sound of the disc. But before you do this I suggest to make sure the thing works after you’ve soldered it. Your Mac will probably not accept most microphone signals. 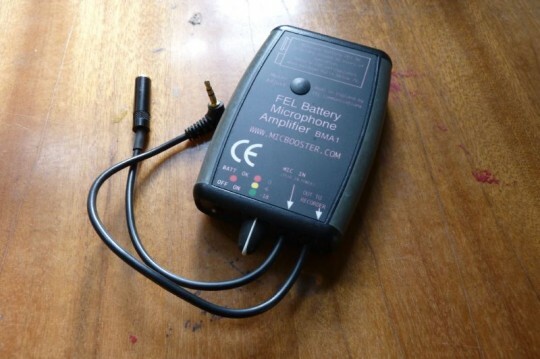 You will need a signal from a mixer or small amplifier to boost the level. Even a small simple microphone needs extra power (most commonly called “plug in power) to a signal. You can read about it here. I also recommend the small amplifiers they sell as I have been using one for several years. I have made a grounded contact microphone following your guidelines. It sounds with an XLR plug, however, i need to change the plug to a 1/8″ mini jack. Any tips on wiring and would this effect the noise levels? Will the micropphone still be grounded? check the photo above for connecting a mini-jack. it will turn your dual piezo into a stereo mic, but then you might as well separate the two. Thanks for the great post! How does the resonant frequency of the piezo affect the sound you get? I would think a lower resonant frequency gets more low end, but wanted to see if my intuition is off base. That’s a good question but I don’t have an answer. I do tend to use piezos with resonant frequencies in the 600-1500 hz range. I’m not an expert but as far as I know the lack of low frequency response in piezos also has to do with their high impedance vs the lower impedance of recorder inputs. Rice’s design uses phantom power for the pre-amp – do you think it is possible / ok to use phantom power on the xlr design you used? In other words, plug the xlr into a desk and turn the phantom power on. Would this help increase the signal? I’m not particularly technical, so this might be a stupid question – if so, forgive me! Hi Simon, thanks for the link. You will need to build a special preamp like Alex Rice’s to use phantom with a piezo. Regular phantom does nothing for piezos without a special preamp and you might even burn them out. My XLR example is only for using XLR jacks. Hi John, thanks for clarifying that. I have put together a pair of mics based on your XLR design. With plenty of input level on audio interface, I’m getting a really responsive result (and no hum). Think I going to put felt pads on, epoxy over top and attach to a “soundboard” (see http://ericleonardson.org/instruments/). Thanks again for your help and the great info on contact mics. The back-to-back piezo disks probably work like a dual-diaphragm ‘Large Diameter Condenser’ microphone – connect them symmetrically (or anti-symmetrically) to give an omnidirectional (or figure-of-eight) polar response respectively. Of course, the polar response is considering them as a hydrophone, rather than contact mic. I try not to bend the piezos at all to avoid cracking the crystal. Contact mics don’t really function like condenser mics as they pick up vibrations in materials rathe than air. I think you are referring to conditions that would produce phase cancellation. The way John describes his contact mic, as long as the piezos vibrate together (( !! 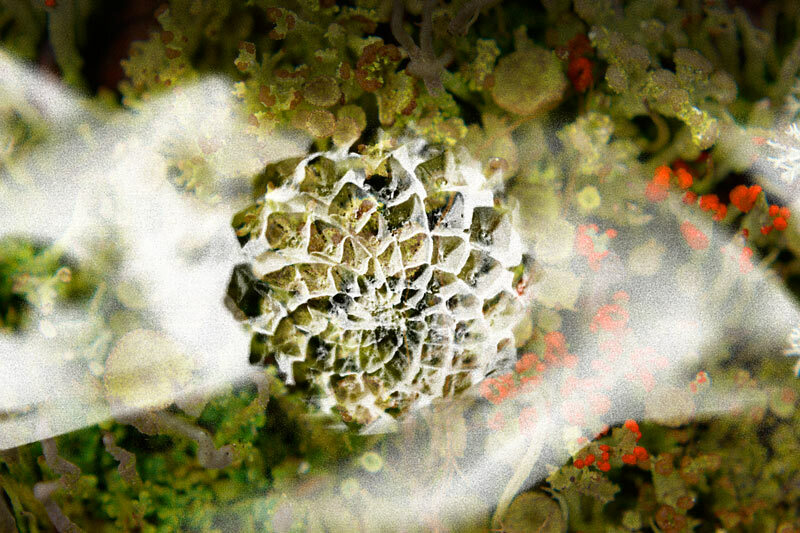 )), they vibrate out of phase, but they are wired out of phase, so this is good! They create a good, strong, clear, balanced signal. This is enhanced if the pad between them is thinner, such as one felt pad instead of two. And this is the manner in which a contact mic generally vibrates. It is analogous to affixing a piezo to either side of a vibrating surface (such as the sound board of a guitar): if I attach the brass backs to either side of the same board, then I must wire them out of phase to create a lovely balanced signal. 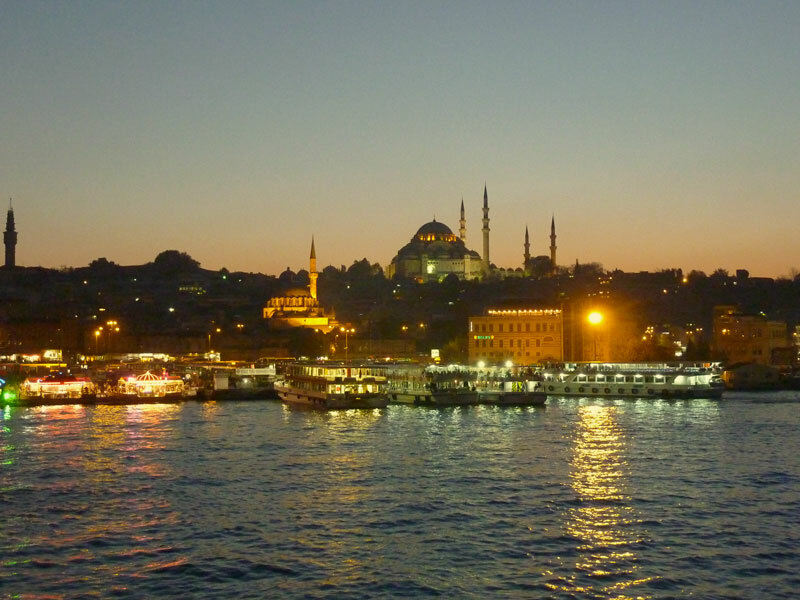 This is a nice post, and I LOVE the wire fence recordings. Is it possible to create a net of contact mics so that it will be possible to use only one amplifier? I have not tried to connect more than two piezos together, but in theory you could connect several together in parallel, but I have no idea how many. As piezos produce voltage you need to check how much voltage your ‘net’ of contact mics will produce.